Advantages: Fascinating story of the formation and early years of Luftwaffe night fighter units, their aircraft, technology and personalities; concise and interesting narrative; large, relevant photos; great profiles - terrific inspiration for modellers. The Classic Colours Luftwaffe Colours project is an ambitious series of books written by an ensemble cast of some of the best respected Luftwaffe experts from around the world. The focus of the series is the camouflage and markings of Luftwaffe aircraft from the first tentative challenge to the Treaty of Versailles to the end of the Third Reich. The Jagdwaffe section has recently come to a conclusion with 20 books in that series alone, but Classic Publication still have plenty of ground to cover. 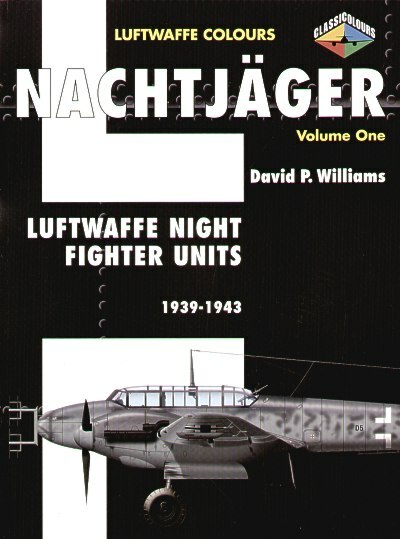 As part of their expansion into new Luftwaffe colour territory, Classic Publications has released "Nachtjäger Part One. This is another fascinating yet largely under-reported corner of Luftwaffe history. Although Germany operated night fighter units as early as the First World War, Hitler's new Luftwaffe of the 1930s was designed as an offensive force. Herman Göring gave little consideration to the possibility of a defensive fighter requirement, let alone a night fighter organisation. Even so, soon after the outbreak of war in 1939, three night fighter Staffeln were formed to deal with leaflet-dropping British bombers. These early night fighter units were equipped with the Messerschmitt Bf 109. It was not until April 1940 that the first night fighter victory was claimed. The turning point in night fighter strategy and tactics came around this same time. Hauptman Wolfgang Falck, commanding a Zerstorer Gruppe, I./ZG 1, believed that his heavier and more heavily armed twin-engine Bf 110 aircraft would be a more effective weapon as a night fighter than the Bf 109. With the co-operation of ground-based radar units to identify bombers and vector the heavy fighters to their targets, a deadly combination had been joined. On 26 June 1940, prompted by Goring's embarrassment after British raids into Germany, the Nachtjag was formed with Falck as Kommodore of NJG 1. Nachtjäger Part One details the background and formation of the night fighter force, covers the personalities and technologies that made the Nachtjag possible, and provides a brief synopsis of operations between 1939 and 1943. This period also saw dramatic changes in night camouflage theory and application. These changes are best documented in the photos and captions, but the specifics of camouflage development are also covered in the final Chapter. The book comprises 96 pages in the familiar large format (303mm x 206mm) of the series. Around 200 photos, mostly of the aircraft of the period, are one of the highlights of this title. Captions are detailed and relevant, and provide useful information about the colours and markings of the subjects. The side profile illustrations are very attractive, and cover from the earliest period where Bf 109Ds wore standard day fighter camouflage, to the distinctive Bf 110Cs and Ds in overall black, through to experiments with pale camouflage and mottles on Dornier 217s and Ju 88s. The Nachtjag is one of the most fascinating aspects of the Luftwaffe. It is very pleasing to see Classic Publications apply its attractive and effective style to this important corner of aviation history.